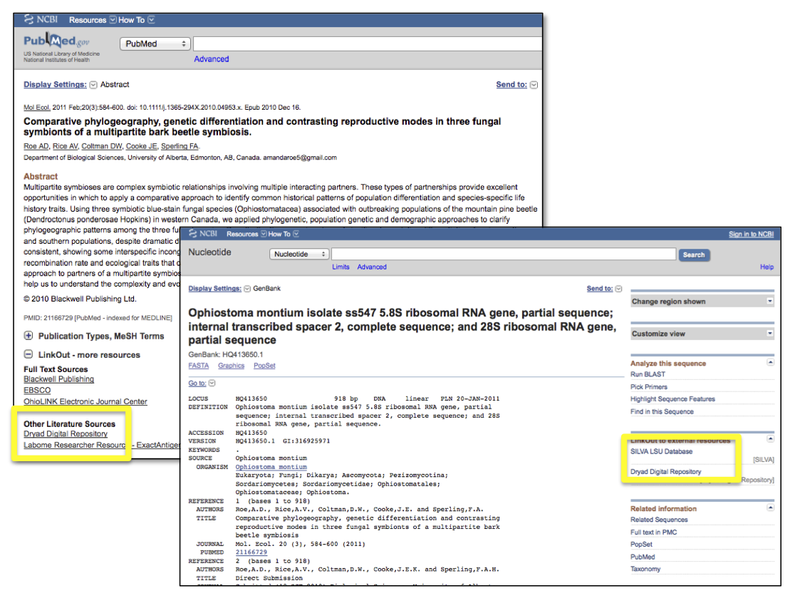 PubMed and GenBank, from the National Center for Biotechnology Information (NCBI), are hugely popular resources for searching and retrieving article abstracts and nucleotide sequence data, respectively. PubMed indexes the vast majority of the biomedical literature, and deposition of nucleotide sequences in GenBank or one of the other INSDC databases is a near universal requirement for publication in a scientific journal. the article’s abstract in PubMed. “LinkOut” is at the bottom of the page; expand “+” to see the links to Dryad and other resources. LinkOut allows the data from an article to be distributed among repositories without compromising its discoverability. At Dryad, we intend to expand on this feature in a couple of ways. First, we plan to make Dryad content searchable via the PubMed and GenBank identifiers, which because of their wide use will provide a convenient gateway for other biomedical databases to link out to Dryad. Second, we will be using open web standards to expose relationships between content in Dryad and other repositories, not just NCBI. For example, keen eyes may have noted the relationship of the Dryad data package in the example above to two records in TreeBASE. To learn more about how Dryad implements NCBI’s LinkOut feature, please see our wiki. This entry was posted in Data availability, New features and tagged data linking by Hilmar. Bookmark the permalink. Very interesting. University of Louisville spinout Intrepid Bioinformatics could really help with this.